It’s great to be a MSSU Lion! 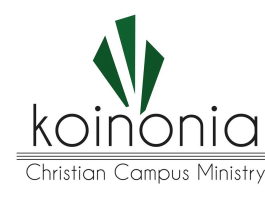 Having graduated from MSSU in 1989 with a degree in Accounting and General Business, I became Campus Minister with Koinonia in July, 1989. God has blessed my family in so many ways through this ministry and through the many students we have been fortunate to meet and grow with over the years. My wife Laura and I met while attending Ozark Christian College where I received my Bachelors in Biblical Literature and in Christian Education in 1989. I went on to complete my MBA in 2005 and my Masters of Arts in Communication in 2013. We have four wonderful children, Brandon who graduated from MSSU in 2012 and is now a Software Systems Engineer for Sony Network Entertainment with their Playstation division in San Fransisco, our Michael – a Spring 2014 graduate in Pre-Med/Biology at MSSU works for Freeman Health Systems, and our daughter Rachel is a 4th grade teacher in Carthage and recently married to a MSSU graduate Andrew Johnson. Lastly there is our son Joshua is 9 and in fourth grade (as of fall, 2016). I grew up in Centralia, Washington, 80 miles south of Seattle and had a wonderful church home there. It was during those years, through a strong youth group program, that I realized the importance of a Christian community of believers to be in fellowship with. I realized how important my faith was as I experienced a Christian environment as a student and as I now see how much it benefits students at MSSU. The Lord is good, and he has blessed me with being a part of this wonderful ministry. Ryan loves to lead God’s people in worship. He is currently a student and also leads worship at Open Door Baptist Church in Carthage. Ryan's family served on the mission field in Ukraine for many years. Ryan is an excellent musician and we look forward to his leadership this fall. Derek Smith Joins us this year in organizing our technology, leading in Discipleship and outreach. Derek grew up in the area and has worked in worship technology for many years. Derek has also served in a leadership role at Chick fil A for many years. ​We are excited to have Derek join our team this year. Synistr joins Koinonia for his 5th year and has been active as student president, core group leader and many other roles in Koinonia. Snyistr comes from the Kansas City area where his dad is a minister and his family active in Christian service. Synister will serve in an administrative role in organizing events, discipleship and other areas of the ministry. Barb has been meeting with several of our women and doing one on one discipleship. Her family is a good friend of our student president Michael Chang. Michael shared Barb's passion for mentoring women and helping them grow in their walk with the Lord. "I am an adult volunteer with Koinonia. I have been blesses so much to see these kids come out to worship and learn about our Lord. They could be anywhere else on a Thursday evening and they choose to come to Koinonia. Praise God! I want do to all that I can to encourage them to grow in the grace and knowledge of our Lord Jesus Christ"
​Randall and his wife Danielle met in Koinonia and were married in January, 2017. Randall and his wife graduated from Missouri Southern. Randall works at Wal Mart and his wife Danielle works as an RN at Mercy Hospital..
Hannah works with the Park Plaza Christian Church youth and has a strong family background in ministry. Hannah attended Ozark Christian College and is currently attending Missouri Southern State University majoring in Elementary Education. Hannah attended Koinonia last year with some of the students from her youth group and will help us this year ministering to our women. "Koinonia has been just what I needed, more than I ever realized. I love the time to get together with other people my age seeking God and to worship him. It has been truly a blessing in my life to have this community of believers to do life with. I am blessed to be able to be a leader, mentor, and supporting friend and sister in Christ with these ladies. I have loved getting to know them, studying God's work with them and praying with them. God has been at work this semester and I'm so grateful for that. I'm thankful for Koinonia and what these people mean to me.